A mission that will orbit the two largest asteroids in the solar system is one of a pair of missions chosen by NASA for the agency's Discovery program. The mission, called Dawn, is managed by NASA's Jet Propulsion Laboratory, Pasadena, Calif. Led by principal investigator Dr. Christopher T. Russell of the University of California, Los Angeles, Dawn is scheduled for launch in 2006. The second new Discovery mission is Kepler, a spaceborne telescope, also scheduled for launch in 2006. It will search for Earth-like planets around stars beyond the solar system. Kepler is managed by NASA's Ames Research Center, Moffett Field, Calif.
"Kepler and Dawn are exactly the kind of missions NASA should be launching, missions that tackle some of the most important questions in science yet do it for a very modest cost," said Dr. Edward Weiler, associate administrator for space science at NASA Headquarters in Washington D.C. "It's an indicator of how far we've come in our capability to explore space when missions with such ambitious goals are proposed for the Discovery program of lower-cost missions rather than as major projects costing ten times as much." Ceres has quite a primitive surface, water-bearing minerals, and possibly a very weak atmosphere and frost. Vesta is a dry body that has been resurfaced by basaltic lava flows, and may have an early magma ocean like Earth's Moon. Like the Moon, it has been hit many times by smaller space rocks, and these impacts have sent out meteorites at least five times in the last 50 million years. The mission will determine these pre-planets' physical attributes, such as shape, size, mass, craters and internal structure, and study more complex properties such as composition, density and magnetism. 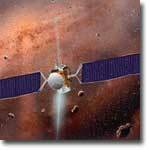 The Dawn mission builds on the highly successful ion-propulsion technology pioneered by NASA's Deep Space 1 spacecraft. During its nine-year journey through the asteroid belt, Dawn will rendezvous with Vesta and Ceres, orbiting from as high as 800 kilometers (500 miles) to as low as 100 kilometers (about 62 miles) above the surface. "I'm ecstatic that we'll have such a great opportunity to show what ion propulsion can do," said JPL's Sarah Gavit, Dawn project manager. "Ceres and Vesta are two of the largest unexplored worlds in our solar system. We'll learn about early planet formation in ways that wouldn't have been possible before this mission." She said she looks forward to working with Orbital Sciences, a new industry partner for NASA's interplanetary spacecraft. Orbital Sciences Corporation, Dulles, Va., will develop the Dawn spacecraft. "With its cutting-edge capability, Kepler may help us answer one of the most enduring questions humans have asked throughout history: are there others like us in the universe?" said principal investigator William Borucki of NASA's Ames research Center, Moffett Field, Calif., leader of the second selected mission. The Kepler mission differs from previous ways of looking for planets orbiting other stars. Kepler will look for the 'transit' signature of planets that occurs each time a planet crosses the line-of-sight between the planet's parent star and the observer. When this happens, the planet blocks some of the light from its star, resulting in a periodic dimming. This periodic signature is used to detect the planet and to determine its size and orbit. Kepler will continuously fix its gaze at a region of space containing 100,000 stars and will be able to determine if Earth-sized planets make a transit across any of the stars. The industrial partner for mission hardware development is Ball Aerospace & Technologies Corp., Boulder, Colo. Kepler's selection involves a delayed start of development of up to one year due to funding constraints in the Discovery program. NASA selected these missions from 26 proposals made in early 2001. The missions must stay within the Discovery program's development cost cap of about $299 million. The Discovery program emphasizes lower-cost, highly focused scientific missions. The past Discovery missions are Near Shoemaker, Mars Pathfinder and Lunar Prospector, all of which successfully completed their missions. Stardust and Genesis are in space; both have begun collecting science data, although Stardust has not yet arrived at its target comet. Contour is scheduled to launch next summer, Deep Impact in January 2004 and Messenger in March 2004. Aspera-3 and NetLander are Discovery Missions-of-Opportunity under development. Information about Dawn and images are available at: http://www-ssc.igpp.ucla.edu/dawn/ . Details about the Kepler mission are available at: http://www.kepler.arc.nasa.gov . Kepler images are available at: http://www.kepler.arc.nasa.gov/downloading.html . Information about the Discovery program is available at: http://discovery.nasa.gov/ . JPL, a division of the California Institute of Technology in Pasadena, manages Dawn for NASA's Office of Space Science, Washington, D.C.